Yesterday we bought a 1965 Gretsch amplifier. Now, I know what you're saying to yourself: "I have certainly seen a number of Gretsch guitars, but I do not recall seeing a Gretsch amp before!" You probably continued your thought: "Forsooth, since Gretsch has spent many a year constructing fine electric guitars, it only stands to reason that they would also manufacture amplifiers." Well, you would be right... and wrong. Although Leo Fender's shop in Fullerton, California, manufactured both guitars and amps, most companies were not set up to do both. And that's understandable. Electric guitars and amps need each other, like pizza and beer. But not many people have both a dough-maker and a vat full of hops. Since companies like Gretsch, Rickenbacker and Martin made quality electric guitars, it's only natural that their marketing departments wanted to also offer accompanying amps. (I know using "Martin" as an example is a stretch... but they TRIED to make a successful electric guitar. And they DID offer an accompanying amp!) Since these guitar companies didn't have a vat full of hops, the logical choice was to enlist an outside company to make their amps. And that's what Gretsch, Rickenbacker and Martin did. Gretsch amps, like the Model 6165 we have, were made by the Valco Company. (Here's John with the amp.) Valco also made amps for Supro, Oahu, National, Airline, and others. Internally the amps Valco made for different companies were identical... only the grill cloth and other cosmetics were changed. Today, in the collectors field, many folks look for vintage Supro amps, since they were used by Jimmy Page in Fred Zeppelin. They may not know that the exact same amps can be found under different brand names... like Gretsch. Now, at this point, you're probably thinking: "Golly, that's darn interestin' that those there guitar-makin' folks tried to get inta the amp business, as well. I wunder if any amp companies had a hankerin' to also sell guitars?" Yes!! And we only have to go as far back as last week's email special to find one. As discussed last week, Bud Ross's Kustom Amp company took the world by storm in 1966. By 1967 Bud decided he needed a guitar to go with his amp line. With cash streaming in from the success of his padded amps, he built another factory to manufacture the guitars. The Kustom K200A electric guitar debuted in the summer of 1968. Within a few months different pickup and dot-inlay options were offered, and the new models were named the K200B and the K200C. (Same body, slightly different features.) And then a bass version was introduced. It's model designation? The K200D. Here's John with a rare "Zebra" Kustom K200A. Here's John with an even rarer Kustom K200D Bass. Unfortunately, a year later Bud sold Kustom, and the new owners did not care for the instruments. By late 1969, after less than 18 months, the guitars were history. And now they're a part of history... the history of guitar and amp manufacturers who attempted to make both pizza and beer. PS: A lot of musical instrument companies were being sold in the late 1960s. And generally, things did not go well afterwards. Valco was bought by Kay in 1967 and they were out of business within a year. With Valco no longer around, subsequent Gretsch amps were made by the Premier/Multivox company and were solid state instead of tube. PPS: Speaking of amplifiers sold by guitar-manufacturing companies, Rickenbacker marketed some interesting amps. We'll have to talk about that in a future email. 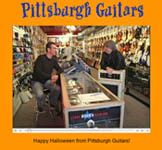 PPPS: Don't forget to enter your Pittsburgh Guitars Theme Song in our Pittsburgh-Guitars-Theme-Song Contest! It could change the world!!!! Night Of The Singing Dead, #16!!!! People are dying to get in this show!!!! Just added today: The Kingston Trio!!!!!! Tickets available here, at the Rex and at Dave's Music Mine. I Can't Help It If I'm Still In Love With You. As I brushed your arm and walked so close to you . "I Can't Help It If I'm Still In Love With You"
PPPPPPS: Customer of the week: The cast of "Wicked"
You know what I like about a rock & roll band? Its simplicity of design. And you don't have to become famous for it to be worthwhile. It can be fun on any level... playing with your band in the basement, or around town, or even on a low-budget tour across the country... (or at the Pittsburgh Guitars Big Beatle Shows!) Music is simply a good thing. No matter what kind of song you play, you always feel better after you've played it. When you hit that last chord, even if it was a blues song, you're happier than when you started. You can't beat that. Speaking of having fun with music, I can't write much today, because two weeks from tomorrow (Saturday, Oct 25th, to be specific) we're doing this year's Halloween Show, Night Of The Singing Dead, #16. Every year my friends and I get together and humorously perform songs from recently deceased celebrities. It's a tongue-in-cheek musical tribute to their careers and eccentricities. And like having a band with your friends, it's lots of fun for us... and the audience loves it, too. And since it's only two weeks away... and we've already sold a lot of tickets... I better start writing it. So, I have to do that today. I'll be back next week with Email Specialis Gigantus! More ramblings then! PS: Next time you're jamming with your band, write a Pittsburgh Guitars Theme Song for our Pittsburgh-Guitars-Theme-Song Contest! There will be prizes! And cake!! Secondly, when I thought of Joan Jett, I thought of her guitar!! Joan has played the same guitar, a 1964-ish Gibson Melody Maker, for the last thirty-one years. AND, not only has this guitar been used on all of her hit records, it was previously used on some else's hit records! That is an impressive guitar! First, let's take a quick look at the history of the Gibson Melody Maker. If you recall, in the late 1950s Gibson made a handful of Les Paul models, in different price ranges. The top of the line was the fancy Les Paul Custom; followed by the Les Paul Standard; then the budget version, the Les Paul Special; and finally the one-pickup budget model, the Les Paul Junior. In 1959 Gibson decided they needed an even cheaper "student" model, and they introduced the "Melody Maker." I suspect part of their motivation for this new model was that in 1959 the Les Paul Specials and Juniors were redesigned from single-cutaway to double-cutaway bodies... and they probably still had some 1958 single cutaway bodies to get rid of. They took the single-cutaway Les Paul Junior bodies, cut them lengthwise to create a thinner, lighter body... mounted a less expensive single coil pickup... and a new "student" model was born, the Melody Maker. Joan Jett's Melody Maker, as evidenced by the body shape, was made between late 1963 and mid-1965. The nice thing about the Melody Makers is that while they were meant to be student models, they are still high quality Gibson-made guitars. The necks are very comfortable and easy to play. And the thin bodies are lightweight and easy to hold. The only downside to the model was the cheaper pickup. For that reason it's not unusual to see older Melody makers with changed pickups. And that's the story with Joan's guitar. Before she got the guitar, its pickups had been switched from the original single coils to humbucking pickups. It had also been refinished in white. And its hit-record history? Joan bought it in 1977 from Eric Carmen who used it in the Raspberries. Here's a youtube clip of Eric with the guitar. Here's a youtube clip of Joan with the guitar before she did a million gigs with it. Here's a youtube clip of the guitar today. In addition to adding lots of stickers, she removed the neck position pickup and had a new, one-pickup pickguard made. PS: If you have a 1965 - 1969 Gibson solid-body and you're wondering if it's an SG or a Melody Maker, it's easy to tell. Although they shared the same body shape, the Melody Makers came in opaque solid colors, red or blue, and they featured white pickguards with the aforementioned single coil pickups. (Although, like on Joan Jett's guitar, the pickups may have been changed by now...) Also, the Melody Makers all featured a narrow headstock, unlike the flared-out headstock of other Gibson models. PPPS: As passionate as "I Hate Myself For Loving You" is, it's actually a collaborative songwriting effort. It was co-written by Joan Jett and Desmond Child. You may not recognize Desmond Child's name, but you've heard his work. He also co-wrote "Angel" and "Dude Looks Like A Lady" with the guys from Aerosmith, "Livin' On A Prayer" and "You Give Love A Bad Name" with Bon Jovi, and "Livin' La Vida Loca" with Ricky Martin. Yep, Desmond has cashed a few royalty checks in his day! After reviewing the information that you provided it appears that the dedicated virtual server that you renting appears to be Linux (or UNIX) based that uses CentOS, Apache,Perl, PHP, and MySQL software for server administration and development. For a quick solution to your current problem, I would recommend that you find someone who is experienced with this specific environment (virtual servers dealing with Linux, Apache, etc...). I can't really recommend anyone because I personally don't know anyone who would have expertise in this area. PPPPPS: Hey, don't forget that Pittsburgh Guitars Theme song you were working on! PPPPPPS: Hey, nice talking to you again! Friday 10/24/2008 ~ Otis, My Man! Hey, the giant elevator is looking good. I t's a quote from the movie "Animal House," when one of the guys calls out to a musician, saying, "Otis, my man!" If you've seen the movie, you know what I mean. If you haven't... well, I don't have time to explain it now... but it was funny. Whenever I hear the word "Otis" I can't help but recall that phrase. I don't think it's possible for me to even THINK the word "Otis" without adding "my man!" It made me wonder what other words immediately evoke follow-up words. Anywho, I gotta saw a guitar in half... so I'll talk to ya next week! More fun than a pie in the face!!!! Friday 10/31/2008 ~ A Halloween Video! This week's email special is a Halloween video! You can see it here!! PS: Also, New from Vox this week! The Satchurator Pedal!! It sounds fabulous!!!! Now in stock at Pittsburgh Guitars! PPS: Pictures from last week's Night Of The Singing Dead #16! "A horse walks into a bar... The bartender says, 'Hey, why the long face?'"